For an animal whose survival depends on being inconspicuous, the Sharp-tailed Grouse has developed quite a following. That’s because once a year, the males of this cryptically coloured species gather together for a dramatic display of dueling and dancing. If you’ve never seen these birds in action, it’s worth a look: though an increasingly rare sight in the wild, a quick Google search will turn up multiple clips of Sharp-tails stomping, vibrating, clucking and chirping at each other, all part of a dance of dominance designed to capture the attention of Sharp-tailed hens. Starting at dawn, the males gather to establish territories on the dancing grounds, known as leks. Birds return to these sites year after year to perform their animated mating ritual, which provides an excellent opportunity for researchers to do bird counts to determine if their populations are changing – or if they’ve disappeared. 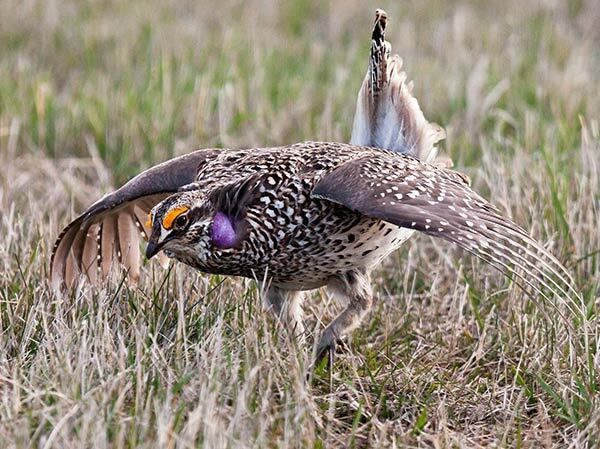 When it was first described by Lewis and Clark in the early 1800s, the Columbian Sharp-tailed Grouse was considered to be the most prolific game bird in the Northwest. Historically, the Columbian subspecies of Sharp-tail was found across nine of the Western United States and British Columbia, but changes to its habitat have reduced it to a fraction of its historic range. While the forest ecotype occupying the north of the province has held its own, the grassland Sharp-tails remain in serious jeopardy:the birds have been extirpated from the Okanagan and are virtually extinct in the East Kootenay. The story of their decline is a familiar one. Sharp-tails became less prolific as the open grasslands they depended on disappeared through development, over-grazing, conversion of range to crops, and the encroachment of forests that would have previously been suppressed by fire. In recent years, there has been increased recognition of the importance of protecting what remains of these rare grassland ecosystems, and restoration techniques such as prescribed burning have been used to reduce ingrowth and return them to their natural state. The establishment of protected areas combined with habitat improvements have made conservationists hopeful that extirpated grassland animals such as the Sharp-tail might be returned to their historic ranges. One of these people is East Kootenay biologist Penny Ohanjanian. Like many, Ohanjanian became captivated by the small grouse species after witnessing their memorable mating ritual. In 1990, the Habitat Conservation Trust Foundation (HCTF) funded her inventory of Sharp-tailed Grouse on selected grasslands in the East Kootenay, where the bird had once been a common sight. Ohanjanian’s field surveys only turned up two individuals. She repeated the inventory in 2005, and this time failed to locate a single Sharp-tail. The bird that had once been an integral part of the East Kootenay landscape seemed little more than a memory, but Ohanjanian was hopeful that they could be returned. She sought out the advice of her colleagues both in B.C. and the United States, where Sharp-tail reintroduction programs had been going on for over 10 years. Rather than reinvent the wheel, Ohanjanian wanted to learn from their experiences in terms ofwhat factors made for a successful reintroduction and the pitfalls of programs that had failed. Armed with information, Ohanjanian set out to do a feasibility study of two highly-ranked potential reintroduction sites in the East Kootenay. HCTF provided Ohanjanian with a grant to evaluate if the Wycliffe conservation lands (which were previously secured with Foundation funding) and a reclaimed tract owned by resource company Teck could successfully support a reintroduced Sharp-tailed grouse population. Ohanjanian’s study included a thorough evaluation of site vegetation to see if it could provide suitable winter cover, nesting and brood rearing habitat for the birds. At first, things looked promising. Range conditions had actually improved over the last 30 years, and there seemed to be adequate summer and fall vegetation for brood rearing. But when Ohanjanian returned to the sites in the spring, she found a crucial component of Sharp-tail habitat was missing: residual nesting cover. Before the new season’s growth is established, Sharp-tails rely on small shrubs and dried bunches of grass such as fescue to provide cover and structure for their nests. Unfortunately, this particular grass species also happens to be a favourite food source for elk in the winter, and they had removed a significant portion in the area. Given the challenges inherent in this type of project, one might ask the question “if there are viable populations of these animals elsewhere, why reintroduce at all?”Despite the fragility of grassland populations, forest eco-type Sharp-tails appear to be doing well, exploiting a new niche in the form of clearcuts resulting from mountain pine beetle infestations. The stability of these northern Sharp-tail populations has allowed them to be used as a source for reintroduction programs south of the border, and may even allow for increased hunting opportunities in the near future. Nevertheless, Ohanjanian cautions against having all your Sharp-tail eggs in one basket. “If you’ve got populations spread out throughout the historic range, if something catastrophic happens in one area, there may still be the genetics to allow the species to persist elsewhere.” With the potential perils of avian disease and climate change looming, it would seem prudent to preserve both ecotypes, both for the stability of the species and maintaining the integrity of the ecosystem as a whole. Perhaps the impetus for returning these birds goes beyond biological reasons and to the heart of our own engagement with a place and the species that formed part of that experience, the human connection that motivates us towards conservation. “These lands at Wycliffe were acquired to preserve what was historically there – the ecosystem in its originality – and the Sharp- tailed grouse was definitely a part of that.” Hopefullythe birds will one day return to Wycliffe as more than just a memory. Sharp-tailed Grouse Battle: a video by the Cornell lab of Ornithology showing the rougher side of Sharp-tailed Grouse leks. 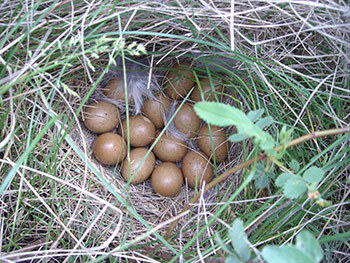 Thank you to Paul Burr for supplying the Sharp-tailed grouse nesting photos for this story. Paul is a M.S. student at the University of North Dakota, working with Dr. Susan Felege on Sharp-tailed Grouse research examining the impacts of development on sharpies and other grassland species. 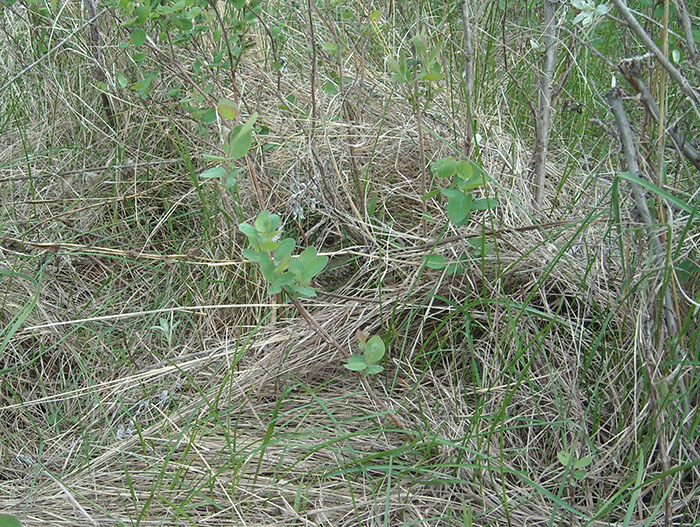 Their Wildlife@Home project uses citizen science to examine sharp-tailed grouse nesting habits and ecology.